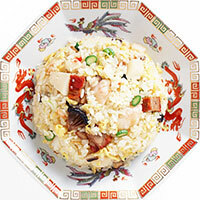 Fried rice is a traditional Chinese homemade dish, usually fried in a wok, with vegetable oil or pork fat. It is commonly mixed with various other ingredients that are left over from preparing other dishes, so there is no exact recipe, per se, although some of the popular varieties have their own list of ingredients. The most common are eggs, vegetables (carrots, broccoli, onions, bean sprouts), meat (chicken, pork or beef), and peppers. It is mostly seasoned with soy sauce, but table salt may also be used. This traditional Chinese dish can be eaten on its own or as a side dish: fried rice can complement the rest of your meal in an incredibly tasty way if you are a fan of Chinese cuisine. The calories in Fried Rice per 371.8g(1 serving) is 673 calories. Fried Rice is calculated to be 181Cal per 100 grams making 80Cal equivalent to 44.2g with 100.05g of mostly carbohydrates、20.86g of fat、15.62g of protein in 371.8g while being rich in vitamins and minerals such as Molybdenum and Selenium.